The Seleção finish in first place in Group E and book their spot in the round of 16 in the World Cup with a convincing 2-0 win over Serbia. RIO DE JANEIRO, BRAZIL – Tournament frontrunners Brazil finally lived up to their hype yesterday (June 27th) in Moscow easily dispatching Serbia, 2-0, to take the top spot in Group E and advance to the 2018 World Cup knockouts. The Seleção will now face off against Mexico in a marquee matchup on Monday, July 2nd. 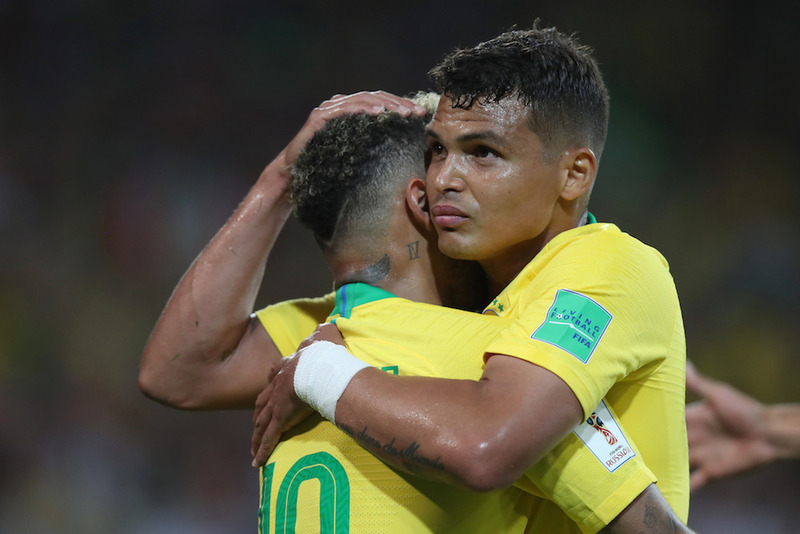 Thiago Silva scored the decisive goal yesterday as Brazil dispatched Serbia, 2-0, to take the top spot in Group E and advance to the World Cup knockouts, photo courtesy of the CBF. Heading into their final group match, Brazil’s offense had yet to fire on all cylinders. In their last match on Friday, June 22nd, the club went scoreless for ninety minutes, until late game heroics from Philippe Coutinho and Neymar salvaged a 2-0 victory over Costa Rica. Brazil started yesterday’s match in much the same fashion, setting the pace early and dominating ball possession, but failing to find the back of the net. Neymar in particular pulled the trigger several times in the first, but misfired on each chance. Finally, at the 36th minute, Brazil broke through. Tournament standout Coutinho lofted a perfect pass over Serbia’s defense to a streaking Paulinho who nudged the ball just past Serbian keeper Vladimir Stojkovic for the game’s first goal. Down 1-0 and with their World Cup season on the line, Serbia picked up the pace in the second period applying more pressure on Brazil. Aleksandar Mitrovic had what appeared to be a game-tying point blank header that was just barely deflected by Brazil’s defense at the 61st minute. The Seleção weathered Serbia’s surge and at the 68th minute they put the game away. Off the Neymar corner, Thiago Silva outflanked his man and buried the decisive header by Stojkovic to seal the 2-0 win for Brazil. With the win, coupled with the surprising elimination of defending champions Germany earlier in the day, Brazil now emerges as the clear frontrunners to hoist the 2018 World Cup trophy. With seven points, Brazil completes the group stage atop Group E with Switzerland claiming second place. The Seleção will now face Mexico in the Round of 16 in Samara, Russia on Monday, July 2nd.